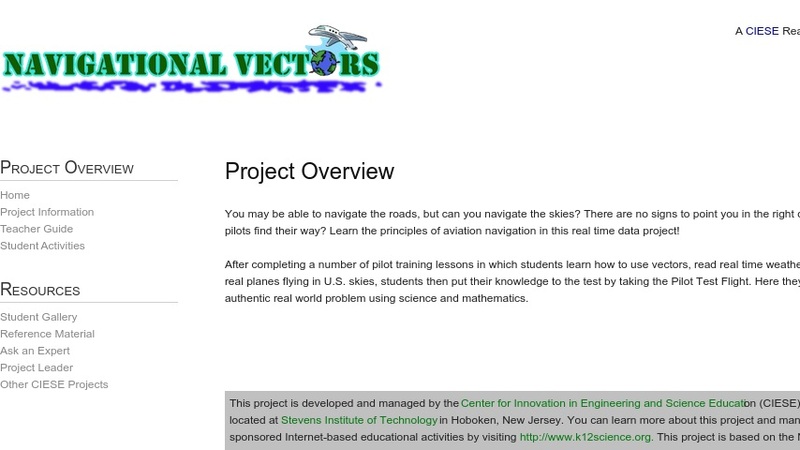 This is a high school instructional unit that features nine lessons relating to vectors. Students build understanding of vector properties as they learn airplane navigation. Problem-based learning activities include reading real-time weather maps, tracking airplanes flying in U.S. skies, calculating vector components, analyzing effects of wind velocity, and completing training segments similar to a private pilot certification program. Participants have access to help from experts at the Polaris Career Center. Comprehensive teacher guides, student guides, reference materials, and assessments are included. This resource was developed by the Center for Innovation in Science and Engineering Education (CIESE). Participation is cost-free; additional options are available for registered users. By the end of grade 10, read and comprehend science/technical texts in the grades 9—10 text complexity band independently and proficiently. Use variables to represent two quantities in a real-world problem that change in relationship to one another; write an equation to express one quantity, thought of as the dependent variable, in terms of the other quantity, thought of as the independent variable. Analyze the relationship between the dependent and independent variables using graphs and tables, and relate these to the equation. Use trigonometric ratios and the Pythagorean Theorem to solve right triangles in applied problems. ?